We are at the forefront of enabling a collaborative platform for better care coordination & efficiency of care to enhance provider-patient relationship. The HealthViewX Referral Management solution is a medical referral tracking software for quick and complete medical referral communication and management. 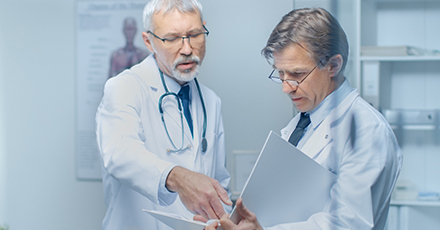 We support pioneering providers with the right solution to effectively manage Medicare’s profitable reimbursement program called CCM (Chronic Care Management). The HealthViewX Care Management solution allows remote patient monitoring to improve patient participation, population health and preventive intervention. What is exciting about HealthViewX 2.0 ? Though HealthViewX has the right solutions for the pain points of the healthcare industry, customization was needed for each client. Through many discussions with our clients, we figured out that though many practices have similar challenges, each one had a unique workflow. Everytime we onboarded a new client, we had to modify the workflow to suit their needs. This was time-consuming and difficult. For eg: HealthViewX has a Chronic Care Management solution. One of our clients wanted to track all call logs within different ranges. Another one of our clients wanted to track only call logs with more than 60 minutes duration. This configuration was not easy as the components were static and not reusable. This is when HealthViewX product experts wanted to make the product more reusable and dynamic. We realized that every practice had unique requirements and workflow. So we enhanced the product by making it a component-based with drag and drop workflow creation in minutes, simple user interface and real time plug & play usable components. Report and Analytical Engine – This helps the users in customizing the information they see on their dashboard and also the information they want to download as reports. Customizations mean the users can choose the format and what data or information they want to view. This information will be a great analytical tool for practices who can study such information and make changes accordingly in future to generate more revenue. Module Engine – The users can now create and manage new modules (e.g. CCM, Billing module etc). Previously with version 1, module creation required more effort and time. Version 2 has made module engine so simple that it can be created by the users themselves. UI Studio – The users can define the design and the layout of data on various modules and forms. This customization allows them to view the data in the way they want to. Template & Form creation – This helps in creating and managing various forms in the platform (e.g. Prior-authorization form, Patient referral letter). For eg: In a prior authorization form, the user can design it with the information they need instead of using a standard form. Integration Engine – This engine now enables setting up link between other systems (EHR, schedulers). The users can manage information on such systems easily with the help of this integration engine. Also it manages back and forth communication. Communication component – It enables asynchronous Messaging, Fax, SMS, and Email. It enables the users to stay in touch always so that they don’t miss out on sensitive information. Custom Workflows – The users can now create and update custom workflows that suit their practice. HealthViewX solution is customizable and user-friendly. The above features are promising and solves most of the challenges in the healthcare industry. To know more about our solution, schedule a demo with us. The HealthViewX end-to-end Care Orchestration Platform guides healthcare organizations through its entire care journey by enabling data-driven decision support and providing real-time insights of patient reported data to promote better care delivery. The platform enables secure communication of patient information and remote monitoring of patient vitals to improve participation and create an interoperable ecosystem for care delivery. We provide three major solutions, they are, The HealthViewX Referral Management solution is a medical referral tracking software for quick and complete medical referral communication and management. We support pioneering providers with the right solution to effectively manage Medicare's profitable reimbursement program called CCM (Chronic Care Management). The HealthViewX Care Management solution allows remote patient monitoring to improve patient participation, population health and preventive intervention. This entry was posted in blog, Referral Management and tagged medical referrals, medicare, referral, referral management, referrals on December 5, 2018 by Helena Nancy.